Your website is your store front window, even if you don’t sell online. We all know that big isn’t necessarily better. Smaller cars are more nimble. Smaller businesses have that advantage as well. But often, smaller businesses don’t see the value of a big presence—at least looking bigger than they are. Bigger doesn’t have to mean a ton of information, but rather the professional look and feel of a larger business. Bigger images, targeted brochures and tight copy helps you get to the point faster and start the conversation sooner. We’ve all been through the PowerPoint presentation that leaves you more confused than enlightened. Short eMails and simpler websites are welcome relief in our information-overloaded society. It’s strange to think that nearly half of all small businesses in the U.S. don’t have an online presence. Perhaps because they fear the cost or lack of technical understanding to maintain a website. Or maybe they don’t feel it’s relevant to their business. And for the small businesses that do have a Web presence, more than 25% of those are not compatible with mobile platforms. That’s a search engine penalty even before the game begins. The fact is, eighty percent of all Americans research online which makes it essential to meet your audience where they are. Your website is your store front window, even if you don’t sell online. So how do you start? It’s really a lot of common sense thinking, and knowing what your clients want. It’s easy to say, “This is what I have to offer,” but is it what your prospects are buying? Is it what they need? And, are you framing the discussion so that your products and services are differentiated? Think about the value you add and what makes your story compelling. Write value proposition that explains the single purpose why customers should buy your products or services. Then make sure this point of difference is reinforced through the website’s visual and verbal content. Before you start writing, work through the navigation of your site, and think about what your clients would expect to see in sub-navigation menus. While you’ll have logical sections on your website, know that doesn’t have to mean multiple pages. Many businesses are finding one long scrolling page suits their needs perfectly. Add slide show graphics to highlight your key points of difference, and galleries to showcase products and services. People want good content, they don’t want to read forever. If you can use images and video, do it. Captions can deliver big stories in small bites. Recognize that a website is never done. By adding content, new pages, additional menu choices, blogs and more you can continue to create value and differentiate your brand. You’ll also be letting the search engines know your site is active, current and a resource for what’s new. That helps improve search ranking. Here’s an example of an entrepreneurial website for Ann Manning, a strategic consultant in the professional and team development space. We collaborated over a two month period to redefine Ann’s services and present what she does in a unique manner. 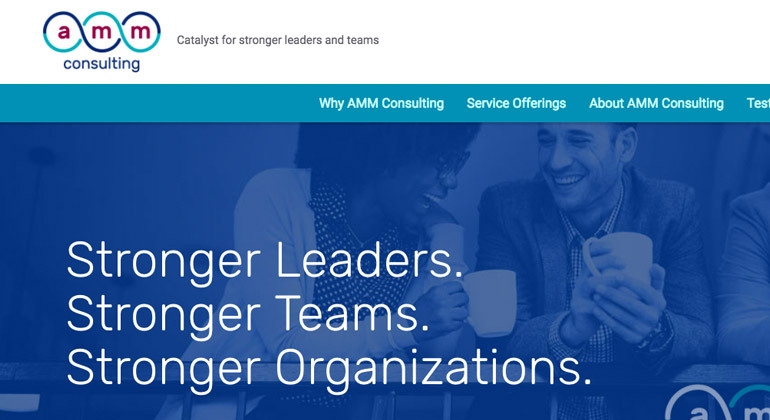 The site highlights AMM Consulting’s unique benefits as a leadership and team builder. New doors have opened since the site launch and she continues to add content through new testimonials and her blog.